Kodaly Inspired Classroom: Gearing Up for Level III and a Sale! Happy Memorial Day Weekend! A special thank you to those who have fought to defend our freedom especially my grandpa and brother in law. I have just completed my tonic solfa for all of the required songs from my Kodaly Level III packet. I am gearing up for a very busy two weeks starting June 2nd! I am also very excited that several of my students will be participating in the WSU Kodaly Children's Choir Camp. I look forward to folk dancing with them, watching their rehearsals with the AMAZING Elaine Quilichini, and performing with them on our joint concert on June 14th. I don't expect I will be adding much of anything to my store between now and the the end of Level 3, but I do have a long list of things I am hoping to get accomplished before the school year begins. I do have a few products that may be helpful as you go through your planning. If you are a new(ish) teacher like me, you probably sit down and go through your concept plans, and yearly/monthly/lesson plans to see what went well, new ideas you have for next year, and ways to improve teaching all your concepts. When I get done with level three I am going to make grade level binders. I will divide the binder into concept sections. Each section will include a concept plan, repertoire list, song materials, and lesson plans. I think having things a little more organized will help me move more effectively through the concepts and that I will like having everything I need for each concept together while planning. I think I am going to use the grade level ones for this year and see how it goes, but I may use the concept ones as dividers. I have also created these binder covers to organize your materials in whatever way works for you! Organize by grade level, concept, yearly plans, lesson plans, plus lots of extras! This is only available right now in the gray chevron print. I figured that this would be the most printer friendly, but if you would like another color, just let me know! A few page examples. Use as binder covers or as dividers. This is available at my Teachers Pay Teachers store here! So how do you spend your summer? Planning, taking college courses, traveling, spending time with the family? We are currently 3 1/2 hours away from home at my in-laws with our 10 month old little girl. She's been such a good traveler! 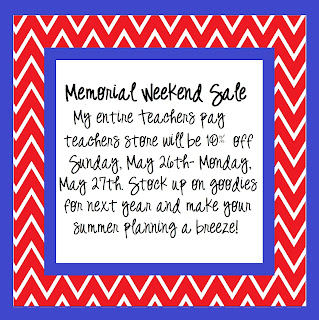 Just one more thing- this weekend through Monday, May 27th, my entire store will be 10% off for Memorial Weekend. Take advantage of the sale to stock up on goodies for next year and to ease your summer time planning!